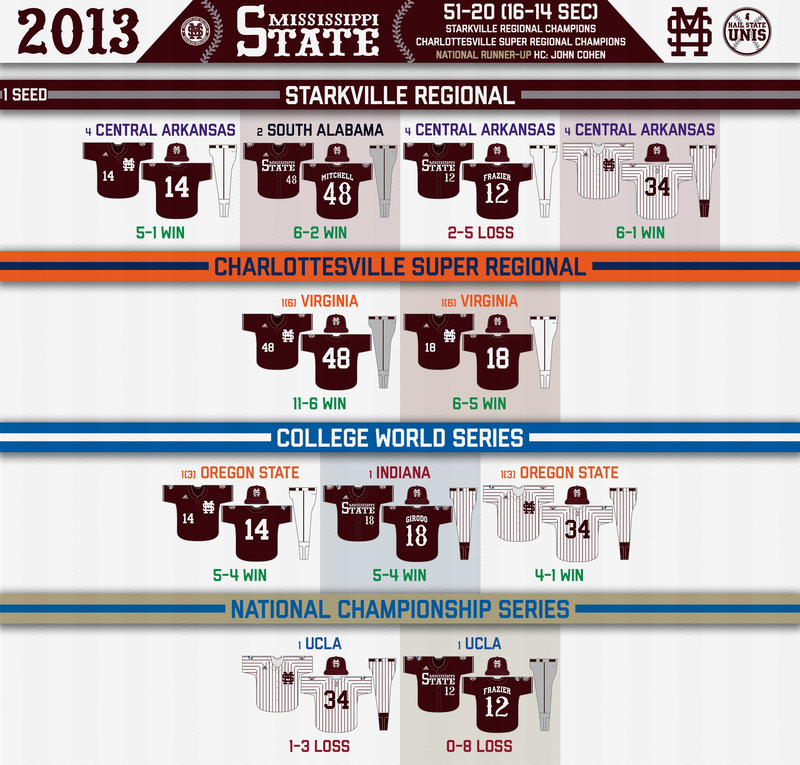 Twenty-Thirteen was a historic season for Mississippi State Baseball. After a stellar non-conference season and a 16-14 record in SEC play, the Bulldogs qualified as a regional host, for the first time under John Cohen. They won their regional, and traveled to Charlottesville, Virginia to play in a super regional. After sweeping the Cavaliers, the Bulldogs advanced to Omaha for the first time since 2007. In Omaha, the Bulldogs defeated Oregon State, Indiana, and Oregon State again to advance to the National Championship Series for the first time in program history. Unfortunately, the Bulldogs fell twice to UCLA in the Championship Series, finishing the historic season as second in the nation. 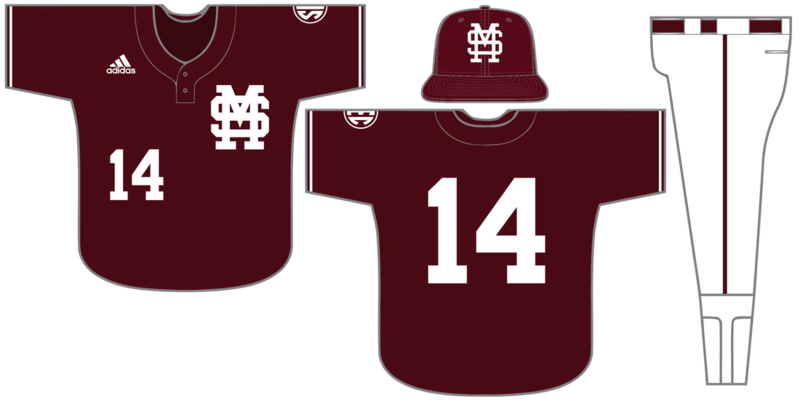 Just as they would in 2016, the Bulldogs started off the 2013 Starkville Regional in the Maroon MS jerseys with white pants. 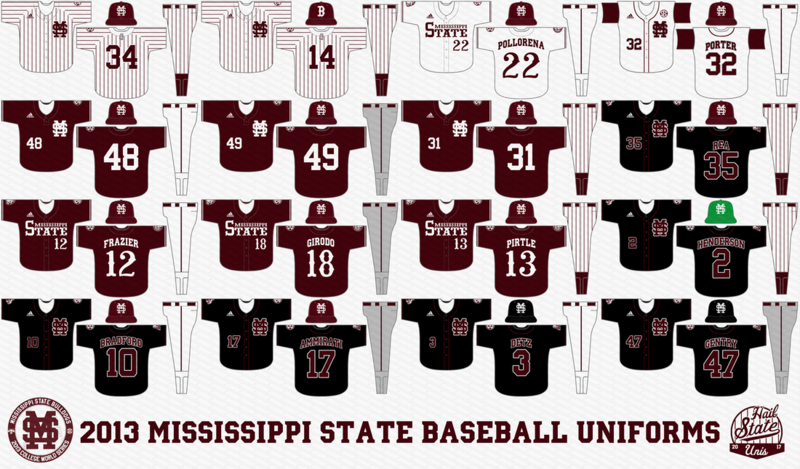 The Maroon MS jerseys were updated in 2015, so the jerseys worn back then were slightly different. They featured a generic block number font instead of the custom “Starkville” font used in all sports by Mississippi State now. In games 2 and 3 of the Starkville Regional, the Bulldogs wore the Maroon 85 jerseys. 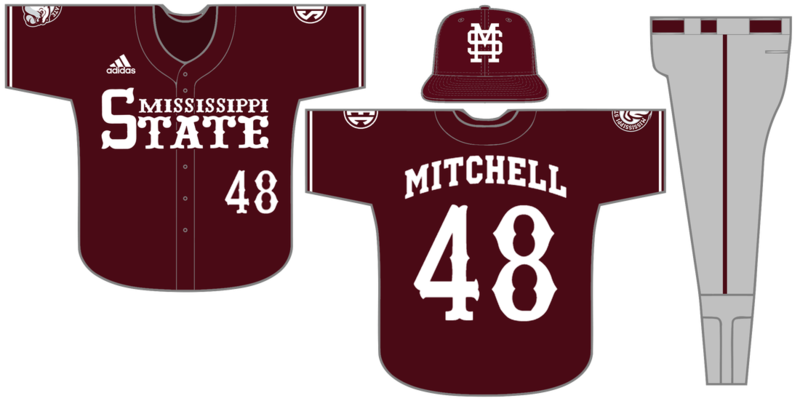 The classic look for Mississippi State baseball, these were also altered in 2015 and were surprisingly never worn in 2016. They were worn with gray pants in the winner’s bracket game victory over South Alabama and white pants in the setback vs Central Arkansas. In the winner-take-all regional championship game, the Bulldogs busted out their beautiful white pinstripe uniforms. These would be the signature look of the Bulldogs’ 2013 run, after Hunter Renfroe’s iconic home run vs Oregon State in Omaha. The white pinstripes were rarely worn in 2014 and were modified, more precisely butchered, in 2015. They did not see the field in 2016, but new, very popular, gray pinstripes did. In the Charlottesville Super Regional, the Bulldogs were given some very ugly, templated rainbow uniforms by Adidas. They avoided wearing them in Charlottesville by pointing out that they lacked an SEC patch. They were worn in some early games in 2014, however. Instead of the rainbow uniforms, the Bulldogs wore the Maroon MS jerseys in both games in Charlottesville, with gray pants in game 1 and white pants in game 2. 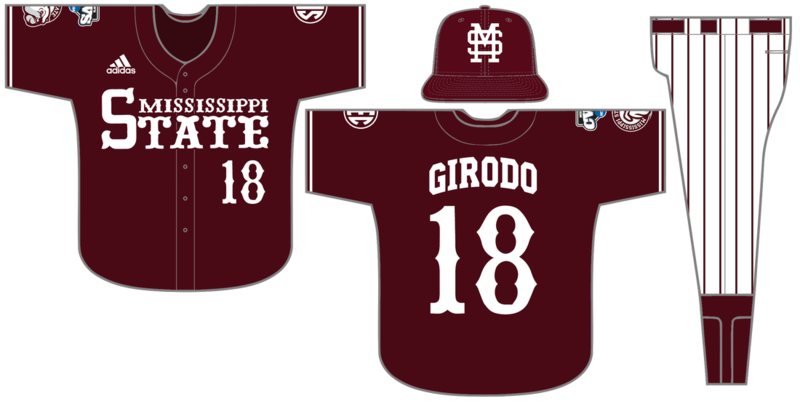 In Omaha, the Bulldogs wore the Maroon MS jersey with white pants as they beat Oregon State, avoiding losing in a walk off by a few feet. In the winner’s bracket game vs Indiana, the Bulldogs wore the Maroon 85 jerseys with pinstripe pants. 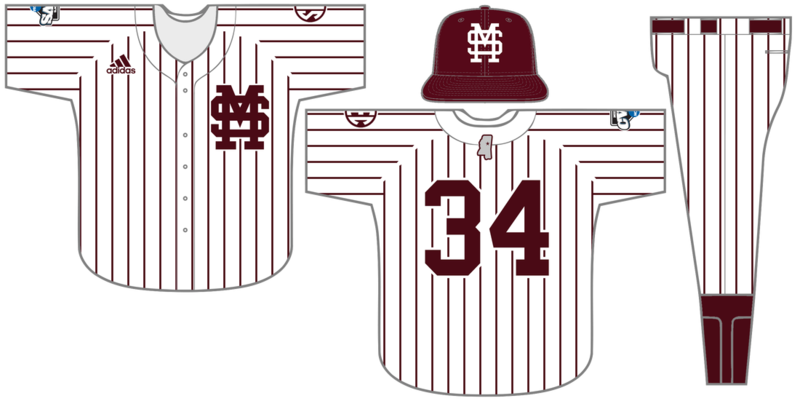 In the third game, playing Oregon State again, the Bulldogs famously wore the beautiful pinstripe uniforms as they punched their ticket to the National Championship Series for the first time ever. 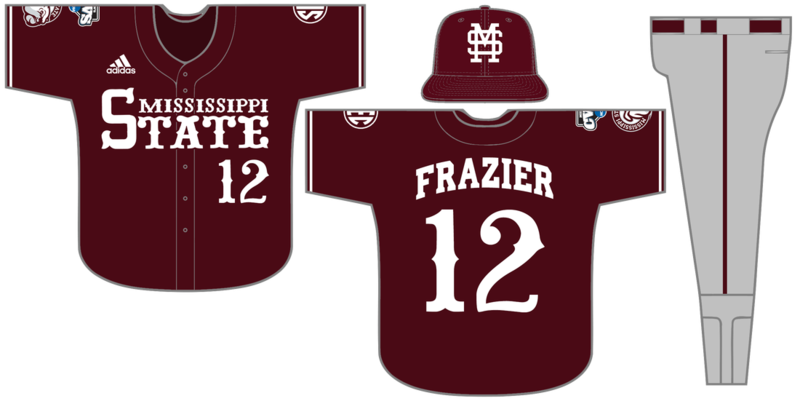 In the National Championship series vs UCLA, the Bulldogs tried to ride the pinstripe magic in game 1. In game 2, they wore the Maroon 85 jerseys with gray pants as they finished the season as the second-place team in the country. As far as I can tell, the Bulldogs wore 16 combinations total in 2013. I didn't start the baseball uni tracker until 2014, so anything I have prior to 2014 is purely based on internet research and therefore may be slightly inaccurate.